In addition to checking the brick-and-mortar versions on our local stores, I also check each store's websites, for specific items for which I'm looking for a deal. Sometimes, a web version of a store carries inventory not found in the brick-and-mortar. And sometimes, the website offers the exact same merchandise, but at a lower price. My local Dollar Tree is the spot where I've been getting my baking soda for the last couple of years. It has been 59 cents for a 16 oz. box. The next best price I have found in our area is Walmart, in a large bag, for 62 cents per pound. A little over a week ago, I was in Dollar Tree, and horrors!! 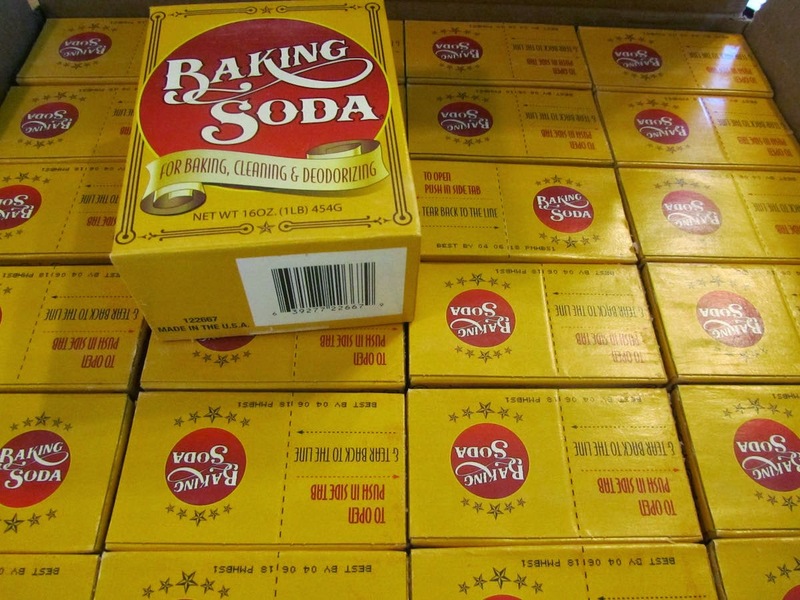 the baking soda had been marked up to 79 cents per box. I slid on home, went online to the Dollar Tree website, and found it had not been marked up online, yet. It was still listed at 59 cents per box. So, I ordered a case of 24 boxes., for 59 cents per box. With Dollar Tree, there's a handling fee if you split up a case. But if you buy the whole case, there's no handling charge. In addition, you have your choice on shipping. You can have it shipped to your home, for a shipping charge. Or, you can have it shipped to your local store, for you to pick up, with no shipping charge. So, I obtained the pre-mark up price, and saved on shipping charges. I saved $4.80 by making my purchase this way. That's like buying 18 boxes, at the new price and getting 6 boxes for free. If 24 boxes of baking soda sounds like a whole lot to you, keep in mind that I use baking soda/vinegar in place of all of my baking powder in recipes, and I use baking soda as my scouring powder in sinks, tubs and showers. I'll also be experimenting with making my own dishwasher detergent this year, so that will use more baking soda. When ordering food products, you do want to keep general expiration dates in mind. I looked up, in advance of my order, the approximate shelf life of baking soda. I suspected that I would have 2 or more years on the case. And I was correct. The case is stamped "best by 04 06 2018". And from what I've read about storage of baking soda, it can maintain its potency long past the best-by date, if stored properly. So, I'm in the clear with regards to shelf life. I completely understand that ordering large cases of products is not for everyone. I get that. Not all "ship to store" purchases need to be in large quantities. Sometimes a store carries a specific item that you want, online, only. For instance, my daughter was needing a special pencil for an art class. It was available online, through an office supply website, but not in their brick-and-mortar store. We've ordered food items through Cash & Carry that weren't part of their regular inventory, but they could have it delivered to their storefront. they give you a pick-up window of about a week. If you miss your "window" the order may be canceled. It's that simple! Just another shopping option for finding the best prices on your needed items. **I'll be making another "ship to store" purchase in the next month. I've found bath tissue at a great price through a website for an office supply store. I'll give you more details when I make that purchase. (I want to make sure everything goes smoothly with that transaction before recommending this store/website). Do you ever run into storage problems with all of your bulk purchases? I have used ship to store options when the shipping to the house was going to be expensive--usually on a large item. It works well. It depends on what you mean by "problems". I can always find some place to store food items, in the kitchen. But I'm not always super duper happy with the organization, or lack of organization. But . . .if purchasing in bulk allows me to have all of the ingredients I need, on hand, to make just about anything my family would want, and still pay the light bill, well, then, that is a success. And that does make me super duper happy. Good use of ship to store, on your part! Shipping usually will kill the deal for us, and not many online stores offer free store pickup. Even our local Wal-Mart doesn't offer free store pickup. But there are enough free shipping promotions around. Recently I saw a fairly good price on lentils (Iberia brand 12 oz for 69 cents at Kmart.com)...the only problem is not available in our area. Our last 13 one pound bags were purchased at Kmart in store for 79 cents. The price has really shot up..around $1.70 a pound. You're right about Walmart not offering ship to store as an option where you are. Walmart doesn't offer that in Hawaii, Alaska or any of the US protectorates. Sorry that can't help you. I can imagine that shipping fees in general must be very high in Hawaii. Does Amazon offer free shipping over $35 purchase to Hawaii? Yes, Amazon does offer free shipping on orders over $35 to Hawaii. Several weeks ago I bought a highly rated computerized sewing machine with 2 year extended warranty for $15.43 (today's deal pricing plus $110 in savings for credit approval, and of course free shipping). I also love to calculate all my frugal savings and note it on my computer program. Kid you not, January thru March savings was over $1000 in estimated savings. I review them for encouragement....if I had been lazy and spendthrift I would have been out that much. For April thru June, I've written my tentative savings on making bulk bean patties and burritos, based on the rate we consume it to saving us at least $5 a day, $1500 per year (assuming some missed days on the low end and possibly more since we are going to eat out less and stock the freezer and pantry with ready to eat foods less). Maybe we won't see it thru the entire year, but certainly the $$ saved is motivation. Writing it down on paper is key. Curious... does bulk baking soda come out of grocery money or household money or what? You use it both for food and for cleaning. I do too. It's a staple in my house along with white vinegar which does double duty for food and cleaning! I was thinking about the very same thing, yesterday. I took the money out of the food category of our budget, but if it looks like I'm using more of it for cleaning, then I may redistribute some of the costs. With vinegar, which I also use for cleaning and laundry, I have taken that out of "food", also. I may have to look at how I apportion these small parts of the budget. In the long run, I would guess that I will use at least half of both products for cleaning, so I "should" be taking only half out of "food". Hmmm, I'll think on that. Good question. As an aside, my budget isn't nearly as tight as yours but it needs to be tighter than it is and I can't tell you how much inspiration you give me... ideas of ways to stretch the dollars that would never have occurred to me. Thanks for saying that. I'm glad that what I do can be of some help to someone else. And, I am inspired by yours and everyone else's stories, too! So, definitely a win-win situation!